Secretary Of State Kerry In Baghdad, With Concern Over Syria : The Two-Way John Kerry is urging Prime Minister Nouri al-Maliki to crack down on flights from Iran to Syria, which pass through Iraqi airspace. U.S. officials say Iran is shipping weapons to Bashar Assad's regime. 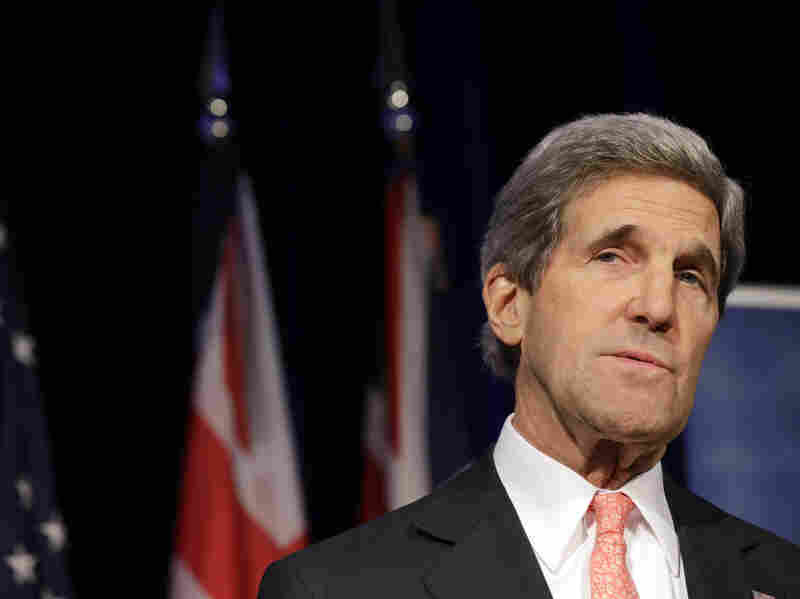 Secretary of State John Kerry is in Baghdad Sunday on an unannounced visit following President Obama's Mideast tour. Secretary of State John Kerry is on an unannounced trip to Baghdad Sunday, and according to an official, the buzzword of the trip is "engagement." "He's ... pressing [Iraqi Prime Minister Nouri al-Maliki] to crack down on, as one official put it, 'the nearly daily Iranian flights over Iraqi territory to Syria.' The U.S. accuses Iran of shipping weapons to Bashar al-Assad's regime and is warning Iraq that these shipments are fueling the conflict and are dangerous to the region." The Associated Press reports the overflights "have long been a source of contention between the U.S. and Iraq." Iraq promised to inspect the flights last year, the AP says, but an official says only two have been checked since then. "The air corridor over Iraq has emerged as a main supply route for weapons, including rockets, antitank missiles, rocket-propelled grenades and mortars, as well as Iranian personnel, according to American intelligence officials. There are supply lines on the ground as well. "Iran has as an enormous stake in Syria, which is its staunchest Arab ally and has provided a channel for Iran's support to the Lebanese Islamist movement Hezbollah." The conflict in Syria rages on: Refugees are pouring into neighboring countries, and the United Nations is investigating the possible use of chemical weapons in the conflict. Kerry's trip comes 10 years after the war in Iraq began. With Iraqi provincial elections in April, having the Shiite government work with Sunnis and Kurds is also a concern for the U.S., Kelemen says. Kerry's trip follows President Obama's Mideast tour, including his first trip to Israel as president.